1) Who has created, developed or recommended this technique ? This concept was developed in the 1980s in Brazil in the State of Rio Grande do Norte by José Carlos Melo for low-income communities. It is now used for many urban networks, primarily in Latin America, but it was also adopted in 1985 for Orangi, the largest shantytown in Karachi (Pakistan), in the suburb of Rabat (Morocco) and in many other peri-urban areas of developing countries. 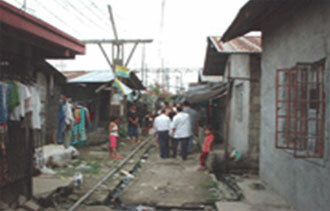 Networks of the condominium type allow a city’s waste water drainage network to be extended to underprivileged peri-urban areas, where housing units are often concentrated, disparate and rather rudimentary, at least cost thanks to simple implementation and to the participation of the population in carrying out the works. They are based on community organisation of the housing on a scale of a group of housing units based on an appropriation and joint management of installations, the condominium. The zones concerned are above all outskirts of big cities where there is a concentration of housing units and where it is sought to combine the little space that is available and save on implementation. 4) What is involve ? Sanitation in a condominium is a new way to design extending sanitation networks in order to allow for creation in poor sections of town that are far from public infrastructures. This is a semi-collective system in that a group of housing units share the costs of installing and maintaining it as a jointly-managed piece of property. -their burial depth, as the latter is no longer built on a public area under the road. - their length : this technique indeed makes it possible to have fewer main networks and special connections in the network. The branches of the secondary networks are also in general shorter, which in the end makes it possible to limit the quantity of materials to be used and the required manpower time. In addition, the co-ownership system tends to make the users of the network accountable. Therefore, there is more respect for the latter and it is better maintained in the interest of all. It is also common for the populations to be involved by digging the trenches required to install the network, which further increases their involvement. Collecting household water is generally done in islands, with each able to have a specific path taking into account the number and the type of housing units as well as autonomous treatment systems selected by the families or the communities. - on the one hand, elements of a domestic nature : the sanitary equipment in the housing units (washbasins, sinks, toilettes), pipes connecting each one to a collection system for the housing unit, a manhole providing access to all of the pipework and for carrying out maintenance. Reduction in construction costs and saves space. Involvement of users : rendering accountable for better use of the installations, increased awareness likely to result in a change in individual behaviour in terms of discharges and sanitation. Feasibility is not the same everywhere. There were for example a few failures for poorly identified reasons in South Africa although this system has practically become a standard in Brazil. There are still no clear factors identified that explain the difficulties encountered in South Africa for the development of condominium networks, but it is likely that the cost of the installations, which are of course reduced but still non negligible for underprivileged families, or that the cohesion, prior information or the insufficient participation of the communities have contributed to it. The population has to be entirely associated with the development of the project, from creating it to maintaining it. It is essential to take into account many social-economic and cultural aspects of the population or of the community concerned and to schedule a major and adapted programme for awareness and sanitary education (illustrated documents, public sessions, posters, schools, street theatre, etc.). It is also important to properly define the respective responsibilities for maintenance between the community, the municipal technical departments and the operator and to ensure that the latter has indeed transferred to the community the technical skills needed for maintenance if the latter is entrusted to it. The quality of the water discharged has to be analysed on a regular basis and be sure to be able to create good sustainable and quality infrastructures despite tier low cost. The cost of creation of course depends on the context and on the country. We can however mention the example of El Alto (High peripheral section of La Paz in Bolivia) which gave rise to an in-depth economic study (Foster 2001). 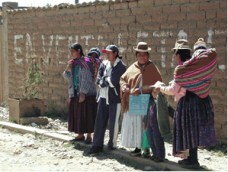 - savings of the same magnitude thanks to participation of the inhabitants in the works. With regards to the cost of maintenance, this is reduced as maintenance for installations on private land is provided by the users who must by the way be trained for this and made aware during the works. Maintenance is the same as for conventional sewage systems but is simplified. This is performed by the users for the portion that is on their land, using the training that they will have received, which is facilitated by the fact that it is in their own best interests to properly care for the installations.